Air Chief Marshal Birender Singh Dhanoa PVSM AVSM YSM VM ADC will arrive in Dhaka on 10 Feb 2019 for a five day visit at the invitation of Air Chief Marshal Masihuzzaman Serniabat, BBP, OSP, ndu, psc, the Chief of Air Staff Bangladesh Air Force. 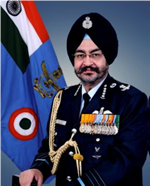 The IAF Chief will be accompanied by his spouse, Mrs Kamalpreet Dhanoa and a two member delegation. The Chief is scheduled to pay a courtesy call on the Honorable Prime Minister of Bangladesh and meet the senior military leadership. The Air Chief will also be visiting major Bangladesh Air Force (BAF) air bases across Bangladesh during the course of his visit. Visit of the Indian Air Force Chief will further strengthen the close and fraternal ties existing between the Armed Forces of the two countries.